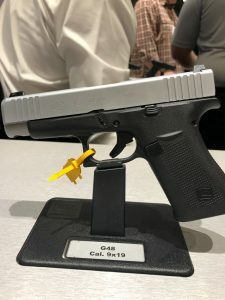 We hightailed it over to the GLOCK booth to get our hands on the new 43x and 48 and ask about the silver-finished slide choice. The G48 9mm has a 4.17″ barrel length and holds 10 rounds. 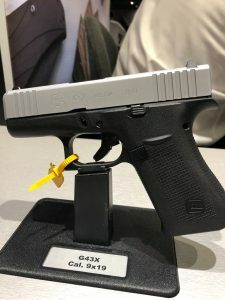 The G43x is a subcompact 9mm with an extended grip frame to fit a 10-round magazine. The GLOCK 43x and 48 together for size comparison. 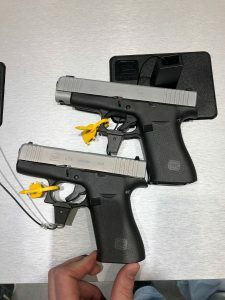 When asked, the GLOCK rep said that there would be more color options in the near future. He told us they’ve had the technology for a while but just haven’t utilized it until the FDE finish on the 19X. Both the 43X and 48 feels great in the hand but are nothing special. 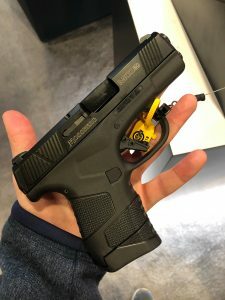 If you like GLOCK and can get over the not all-black and are into the size choice from GLOCK, you’re probably pretty pleased. We’ll wait to decide after we get a chance to put them through their paces. But we suspect they run like a GLOCK, which is good in our book. 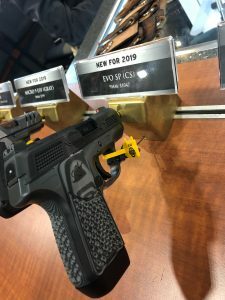 We wrote about the new GLOCKs leak a couple of weeks ago here. 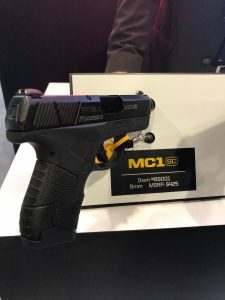 We stopped by Mossberg to get our hands on the MC1SC. Feels great. 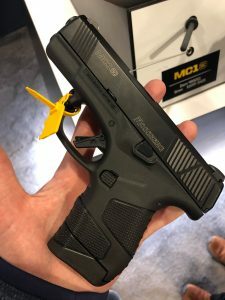 Mossberg’s first handgun in 100 years. 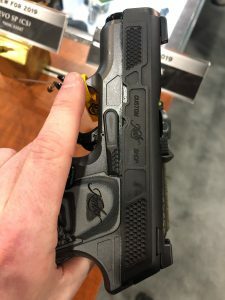 The MC1SC has a trigger safety and 3.4″ barrel. The MC1SC is made in Eagle Pass, Texas. Here is the new striker-fired Kimber EVO…not sure yet how we feel. The Kimber EVO is a striker-fired concealed carry pistol with metal frame. 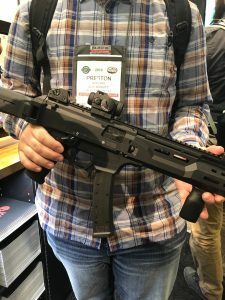 Magpul had the new 35-round PMag for the CZ Scorpion Evo 3. CZ Scorpion EVO 3 35-round PMag. What do you think about the new stuff so far? Are you into either the GLOCK 43x or the 48? How about the striker-fired Kimber? Tell us your thoughts in the comment section.